Micron/China Holding Markets Back - Technical Traders Ltd. - Investment Strategies, Analysis & Intelligence for Seasoned Investors. The NQ has reacted quite differently than the ES. This 240 minute NQ chart shows the deeper price rotation recently as well as the pennant formation that has constrained price. Additionally, one can clearly see the upside breakout of this pennant formation recently and the return of price to near-term support (near 7030). 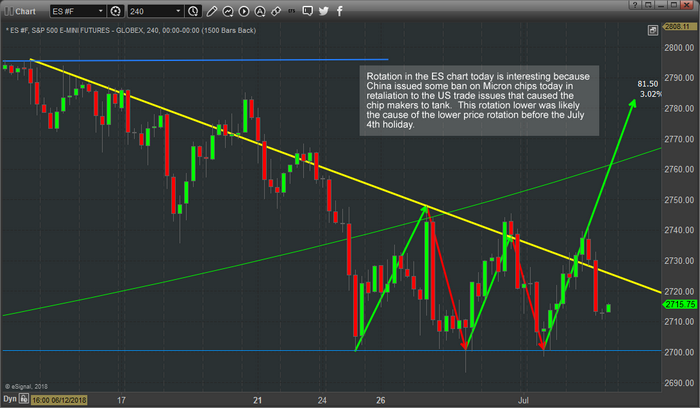 This return to support on the China news could indicate a renewed test of support before an upside move. Although we don't expect the NQ to rally as much as the ES and YM charts, we do still expect to see some upside price moves in the NQ over time. 7200 to 7300 would be our immediate upside targets. 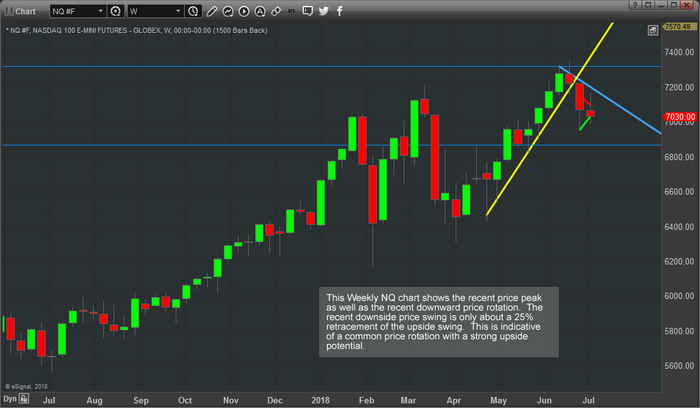 This NQ weekly chart shows just how clean the upside move has been after the February price collapse. While many people were initiating short positions thinking the markets were going to fall further, the rush of capital into the NASDAQ continued to drive capital valuations and appreciation. Now, with Q2 earning right around the corner, we believe the NQ will rally a bit on earning news, yet fail to really push much beyond the 7400 level. We believe the real earnings values will be in small caps, blue chips and the DOW and S&P. We don't believe we will see blowout earnings numbers from most of tech this time. 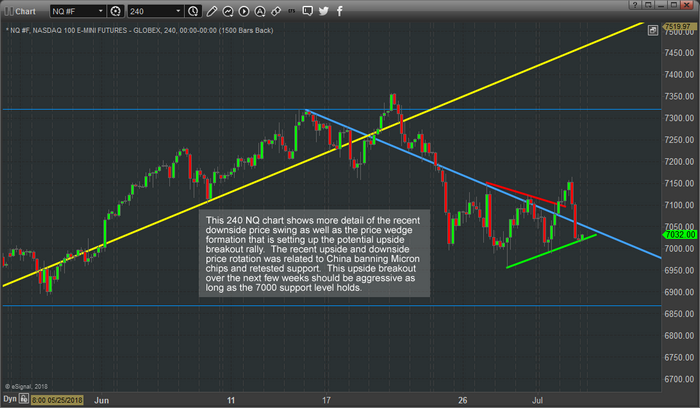 A move to near 7400 would be a renewed push to new NQ highs. This would be a very positive move in the markets and would put incredible pressures on the shorts – creating a short squeeze. Far too many people fail to understand that a large amount of foreign capital is trying to avoid devaluation and price depreciation. Investors don't like to sit on long-term holdings when a currency is devaluing excessively and stock prices (in that currency base) are devaluing as well. It is like a double-whammy of loss for investors that can easily move that capital into something without these risks. Therefore, as long as the emerging markets and foreign markets continue to experience some levels of price contraction, we believe the strong US Dollar and strong US Equity markets will be the “market of choice”. This means a continued “melt up” as global traders rush to find an investment that can avoid the risks of local exchanges/equities. Please don't get caught off-guard with regards to this price rotation and what it means to the markets. A massive price expansion pattern is setting up in the US markets that may drive prices much higher all the way through 2019 and possibly further. 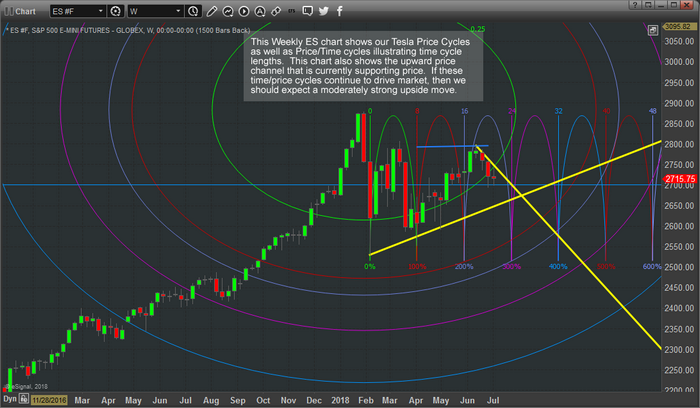 We believe many of the major analysts have missed this pattern and we have positioned our loyal members to take advantage of this move in the future. AND RECEIVE DAILY ANALYSIS & TRADE ALERTS!